All it takes to be the life of the party is a pack of Mentos and a bottle of soda. It turns out the two have a scientific reaction that will turn your home into a literal "soda fountain." Keep in mind that the area around you will get wet and sticky, so proceed with caution. Open the soda and place it on a flat surface. If you have found a test tube, open the Mentos and place as many as possible inside the tube, making sure that they can easily slide out when the tube is tipped over. Place the index card on the open side of the tube and hold just over the mouth of the bottle, so that the only thing keeping the Mentos from falling in is the index card. When everyone is ready, pull the index card away and drop the Mentos into the bottle. If you do not have the test tube and index card, then you can try to feed them into the bottle using your hands. Be ready! The soda will quickly react with the Mentos, creating a geyser several feet tall. 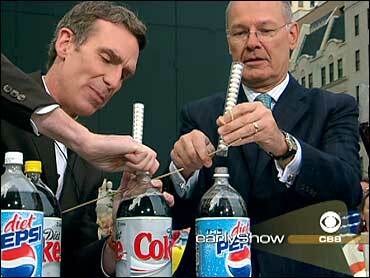 Nye explained that the carbon dioxide in the soda has an affinity for the surface of the Mentos and sticks to it. Tiny bubbles start to form at such a fast rate that it forces a fountain to come out of the bottle. The flavoring in the soda affects the rate and size of the explosion. The more flavoring droplets, the faster the flow.